Stuffed with chunky Chicken Breast and a mix of veggies. Served with our homemade sweet teriyaki dipping sauce. Dusted with our secret seasoning. Served with homemade chip dip. A favorite from our neighbors in Wisconsin. Caution! you may become a Green Bay Packers fan if you eat too many. Get a side of ranch for dipping! Awesome with our Cajun Ranch... Add Coney Sauce, Beer Cheese, Onion, & Jalapenos for 3.5 more! INCREDIBLE. Warm HOMEMADE chips, covered with Grilled Chicken, Warm Beer Cheese, Lettuce, Tomato, Onion, Green Pepper, Jalapenos, and Black Olives. Salsa and Sour Cream available by request. 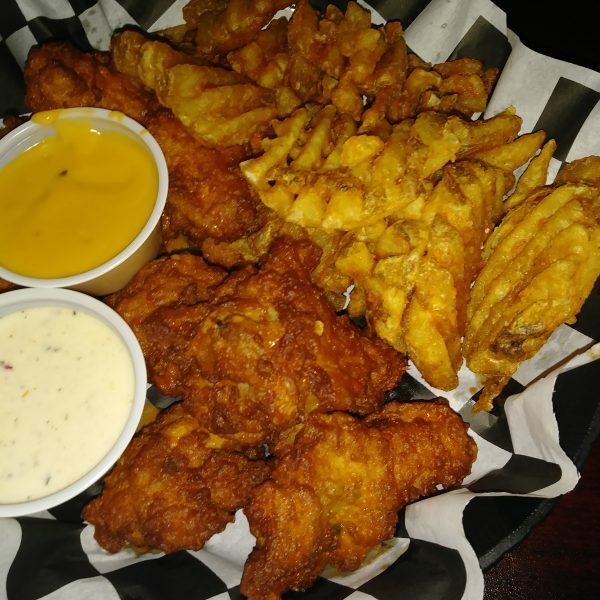 Boneless Wings, Spring Roll, Jack Cubes and your choice of Chips and Dip or Waffle Fries. Great with our Teriyaki and Cajun Ranch dipping sauces! This Chicken "Philly" is incredible. Chicken Breast sauteed with Green Peppers, and Onions topped with Provolone and a splash of Cajun Ranch. Choose a Pretzel Bun, Bakery Bun, or Wrap. They will all make your soul ring with happiness. Served with House Chips & Dip. It's what's inside that counts. Chicken, Bacon Wrap with your choice of sauce and cheese, lettuce, and tomato. Served with House Chips & Dip. You'll flip over this Quesadilla. Chicken, grilled onions & green peppers "come together" with a special blend of melted cheeses. Served with Salsa and our House Made Tortilla Chips. Contrary to it's name, this Chicken Bacon Club is happining! Grilled chicken breast, topped with Swiss Cheese, Bacon, Mayo, Tomato and lettuce on your choice of a Pretzel Bun or Bakery Bun. Served with House Chips & Dip. Who would think grilled cheese sandwiches could be this good? Swiss, Cheddar, & Provolone are grilled on thick sliced bread with fresh tomato and just a dab of mayo. Served with House Chips & Dip. Grilled Bread, over a 1/2 pound of Bacon, Lettuce, Tomato and Mayo. Served with House Chips & Dip. A grilled VEGGIE sensation that will overthrow your senses. Get it on grilled bread, a bun, or in a wrap! We saute Onion, Green Pepper, Mushrooms, Jalapeno, and Tomato together with of your favorite cheese and assemble it with fresh leaf lettuce and your choice of sauce. Served with House Chips & Dip. Your choice of Bakery Bun, Pretzel Bun, Grilled Bread or Wrap! “Black-N-Blue” smothered with sweet honey BBQ and Bleu Cheese. Loaded with sautéed onions, lettuce, tomato, and pickle. This one lets you know who’s running the show. Onion, Mushrooms and Jalapeno are sautéed together and buried under Sharp Cheddar. Topped with your choice of Cajun Ranch or Honey BBQ, Lettuce, Pickle and Tomato. This sandwich is truly the winner. Swiss Cheese, Sautéed Mushrooms and Grilled Onions, Mayo, Lettuce, Tomato, and Pickle. Sautéed Onion, Cheddar Cheese, and loaded with Olives, if that brings you "peace", this is the sandwich for you. Topped with Mayo, Lettuce, Tomato, and Pickle. This one gets any President’s seal of approval! Buried in HOMEMADE Coney Sauce and smothered with Fresh Onion, Jalapenos and Cheddar Cheese. Dressed with Lettuce, Tomato, and Pickle. This sandwich has a messy reputation, but well worth the challenge! We Double up the meat! Double up the Cheddar Cheese! Grilled Onions, Bacon, and Honey BBQ Sauce. Lettuce, Pickles, and Tomatoes piled high for an over the top treat. Think you can take this one down or will it get the best of you? All we can say is BE VERY HUNGRY! to build your favorite masterpiece! Includes Lettuce, Tomato, and Pickle. We use FRESH Angus Beef and Natural White Meat Chicken Breast. No additional salt or seasonings are added to our burgers or sandwiches. Ask your server about menu items that are cooked to order. Consuming raw or undercooked meats, poultry, seafood, shellfish, eggs or unpasteurized milk may increase your risk of foodborne illness. Food Allergies? Ask for a copy of our FOOD ALLERGEN GUIDE.